[caption id="" align="alignright" width="334" caption="Float above Central Virginia during your next romantic weekend."] [/caption] The jumps have started in Orange Virginia, just outside Charlottesville. Experienced and novice skydivers alike are consulting their calendars and making reservations in Orange Virginia Bed and Breakfasts. Have you ever dreamed of flying? Really flying, not in a plane or helicopter but just you in the air? Never mind that skydivers only fly down - the experience is still exhilarating. The skydiving center at Orange, VA, is the closest diving center to the D.C. area. They offer tandem jumps for novices, classes, and solo jumps for more experienced jumpers. For the next month, jumps take place several times a day on Saturdays and Sundays (weather permitting). By mid April, jumps should be available Wednesdays through Sundays. 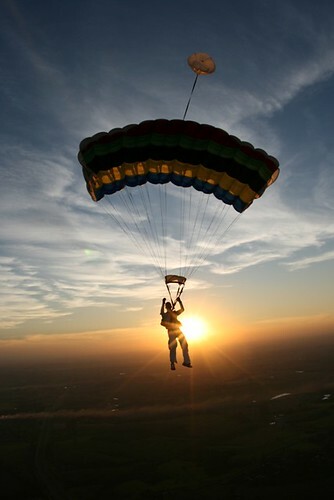 Skydiving can be a great addition to special occasions such as birthdays or anniversaries. Some couples have traditions of jumping together several times a year. Consider adding a jump to your next romantic weekend at a Bed and Breakfast Orange VA - your idea of romance may never be the same again. For more information about jumps, please see Skydive Orange.